Colonia del Sacramento - we are opening doors of museums in La Antigua Colonia as well as presenting the Basilica of the Holy Sacrament and Lighthouse (El Faro). 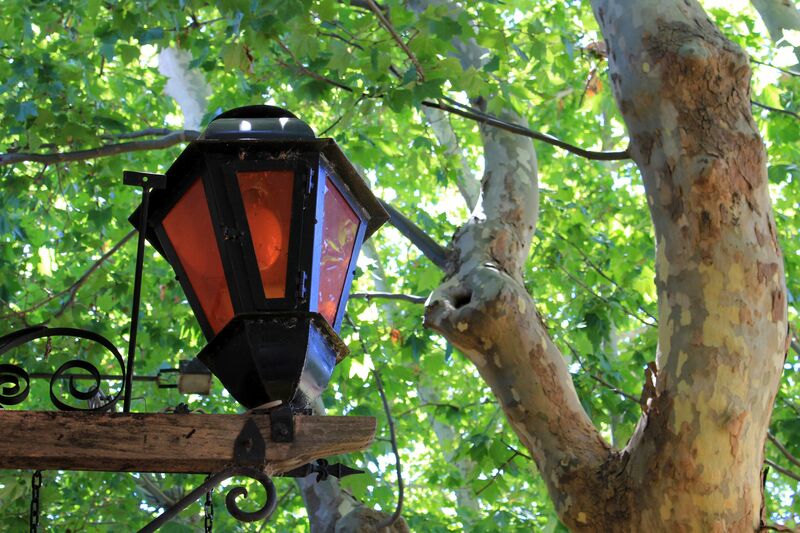 Colonia del Sacramento: Barrio Historico - cont. Most streets in the Barrio Historico are lined by yellow-tinted lamps. Although they are relatively new additions to the old city, they seem to imitate the shape and retain the feel of the old oil lamps that lit the streets in the past. Here and there, you will spot old cars, some still proudly used by their owners, and some taking root as street decorations, beautifully contributing to the magical atmosphere of the Colonia Antigua. Occasionally, a horse-riding gaucho trotting along will remind you not only of the city’s colonial past, but also of the reality of the present-day Uruguayan countryside. The old city has many amazing points of interest and museums. Some are described in more detail on these pages, some are just briefly listed. This one-nave church, designed by the famous Spanish architect Tomas Toribio, was completed in 1808. But its present day embodiment is a succession of a few other churches erected in the same place under the common name -Basílica do Santíssimo Sacramento. The first church was built from straw and sod in 1680 – the year Colonia was founded. Like most structures of that time, it followed typical “birth-and-destruction” cycles for all kind of reasons like fire, structural problems, wars, and so forth. For that reason, the Basilica of the Holy Sacrament is sometimes unfairly considered the oldest church in Uruguay. Most believe that is why it is also sometimes called Iglesia Matriz (Mother Church). 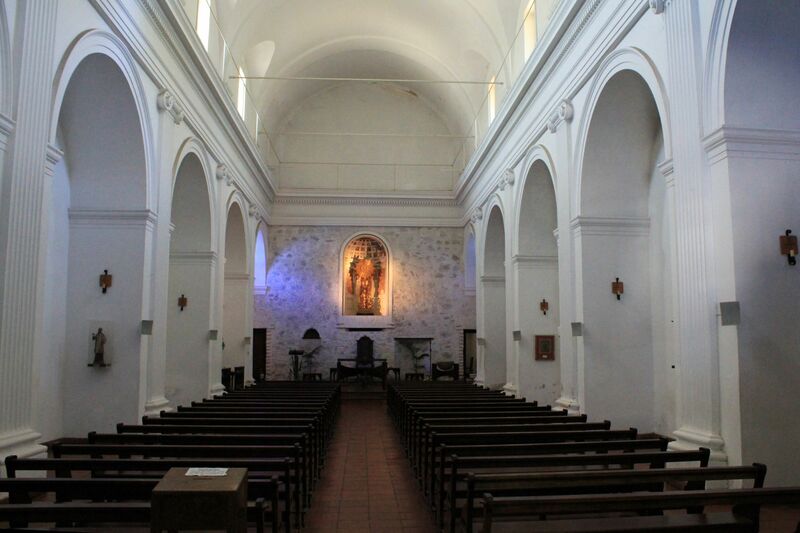 However, the oldest existing Uruguayan church – a small chapel called Iglesia San Benito, dating from 1761, is located in nearby Real de San Carlos. Tomas Toribio’s work did not last long. In 1823, a lightning strike ignited gunpowder stored under the sacristy, totally wiping out the upper part of the church. But once again, the church was rebuilt – this time, between 1836 and 1841, and with great effort to preserve its previous style. The final touches to the entrance portal and towers to Toribio’s original design were completed in 1976. Basilica of the Holy Sacrament. The church is imposing, yet its simple structure hides thick, defensive walls. Inside, the church retains the original, delicate lines of the single, narrow nave flanked by lateral chapels. White walls and lack of usual ornamentation emphasize the atmosphere of peace…. Inside this architectural simplicity juxtaposed with a long history of disasters, the church houses several masterpieces of religious art. A wooden altar from the 16th century, an original baptismal font from the late 17th century, a wooden crucifix carved by native Indians, a 19th century bishop’s throne, a wooden sculpture of St. Francis of Assisi, and a tabernacle carved from the jacaranda’s wood are among the church’s many treasures. You will also find a few pieces of art on display from the government’s collection, such as an 18th century painting of Archangel St. Michel (originally from the city of Colonia del Sacramento). The construction of the lighthouse began in 1845 under the rule of Argentine dictator Juan Manuel de Rosas. Because the work was frequently interrupted by wars, it took almost 12 years to complete the project. Finally, on January 24, 1857, the lighthouse located at San Pedro’s Point (Puenta de San Pedro) was opened. The 27-meter (88-foot) tower was built mostly from stones recovered from the ruins of the 17th century Convento de San Francisco (San Francisco Convent), right next to it, which was destroyed by fire some 40 years earlier. The original red-light bulb, located at 34 meters (111 feet) above sea level, could been seen from a distance of 16.5 nautical miles (about 30.5 km, or 19 miles). Today, the bulb flashes a white light every 9 seconds over a shorter distance. These days, visitors can climb the 118 steps of the lighthouse at the cost of a few Uruguayan pesos. Imposing stone structure of the Basilica of the Holy Sacrament. Right - wooden altar from the 16th century (covered by glass wall for protection). Center - Main Entrance to the church. Right - specifications of the lighthouse from the time of its opening (inscription on the ceramic tiles). Stone walls – remnants of the Convento de San Francisco next to the lighthouse. Views from the top of the lighthouse: city, shore (surprisingly there is no beach) and the nearby restaurant. From the top of the lighthouse on a nice, clear day, you may see Buenos Aires’ skyline. But if you climb the lighthouse tower in the evening, you may be rewarded by the sight of a magnificent sunset falling over the waters of Rio de la Plata. This lovely view over the old town is a perfect culmination to your visit to Colonia. Standing nearby are stone walls – remnants of the Convento de San Francisco, which sharply contrast the white silhouette of the modern-looking lighthouse. Well, we are half-way through the tour. Now, in front of us are numerous museums.